Summon: Give friendly creatures +1/+1 for each Keyword they have. Battlereeve of Dusk is an epic Intelligence creature card. 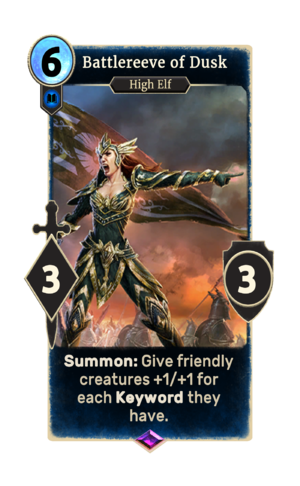 Battlereeve of Dusk was the monthly card for November 2016. It can be soul-summoned by anybody regardless of participation in ranked. As with all other monthly cards, the premium version was not awarded to anybody and must be obtained through soul-summoning. "My troops are the finest in the Isles." This card's summon ability applies the Dusky Skill card effect. Note that only Keywords will work, and not other card effects. The card is named for the Summerset city of Dusk.